. About Us Adhesives Angelus Leather Paints Angelus Shoe Boot Polish Brisbane Suburbs Christian Louboutin Sole Repair Collonil Shoe Car Care Products Waproocolorchart Complete Product List Complete Shoe Repair Services List Contact Us Greek Style Sandals Horse Care Products Horse Riding Boot Repair Index Ladies Shoe Repair Leather Conditioner Leather Dye and Oils Mens Shoe Repair Motorbike Boots Repair Mountain Ice or Rock Climbing Hiking Boot Repair Non Slip Soles and Heel Grips Other Payments Postage Costs Outside Australia Price List Brochure Shoe Deodorant and Shoe Perfume Shoe Insoles and Heel Grips Shoe Paint and Shoe Polish Shoe Stripper and Shoe Cleaners R M Williams Suitcase Repair Testimonials Tips and Tricks Waterproofing Products Waproo Suede and Nubuck Suede and Nubuck Zipper Repair Click on the Arrow then press "Go"
The soles of motorbike boots are the ones that easily worn out. We can replace your old soles with the new soles. We can supply these soles for you or you can send or bring along your own replacement soles and metal toe caps - we can put them on for you. The compound we use to stick them on depends on the component materials of the boots. 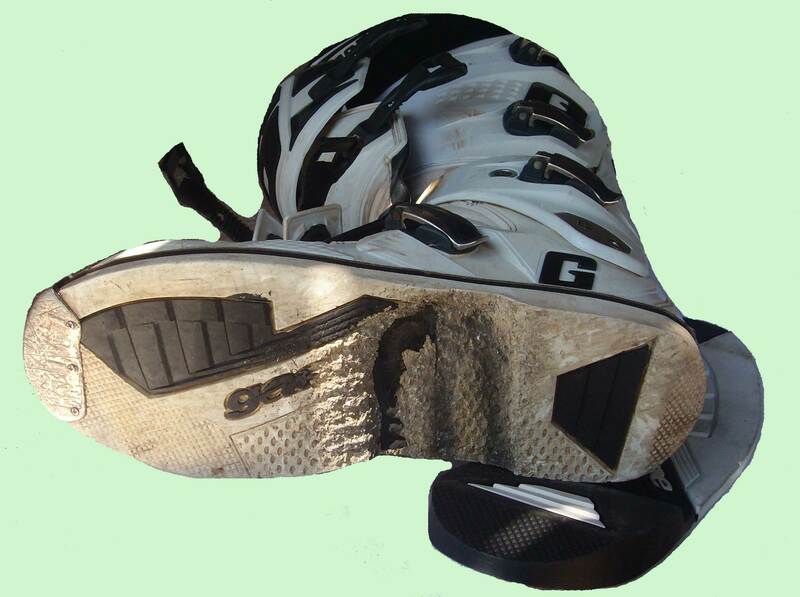 The soles of motorbike boots are the ones that easily worn out. We can replace your old soles with the new soles. Bring your own replacement soles and metal toe caps- we can put them on for you. 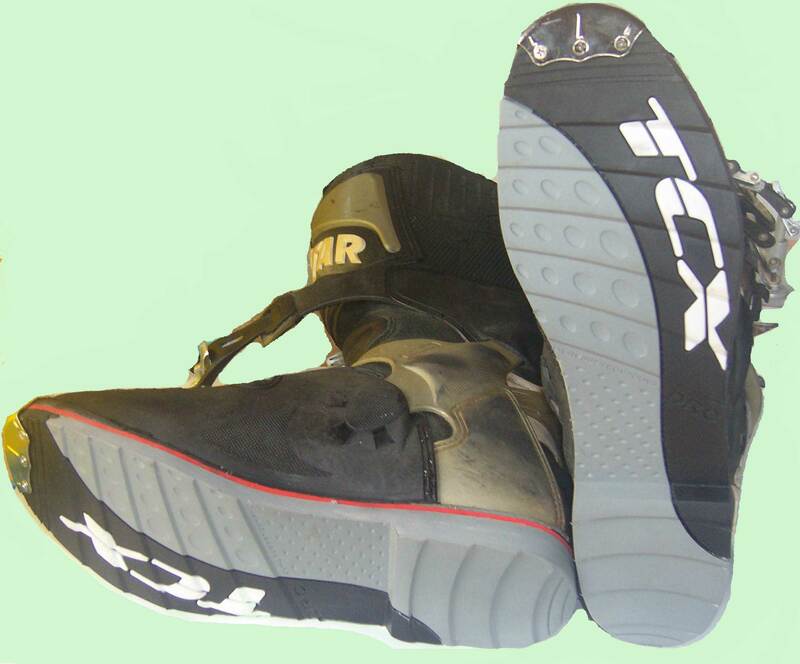 If you do not have one, we have the replacement soles for TCX Pro2.1 Size 42-44 and Size 45-47 currently in stock. The Enduro soles of of TCX X-Dessert Gore- Tex boots are not available as replaceable soles. However when they are worn out and need replacing we can replace your old soles with a Vibram soles as in the photo. When the midsoles of your Rossi motorbike boots start crumbling away from the outsoles, we recommend replacing them with the Vibram Clusaz soles as in the photo. The new Vibram Clusaz soles are stitched into the upper. 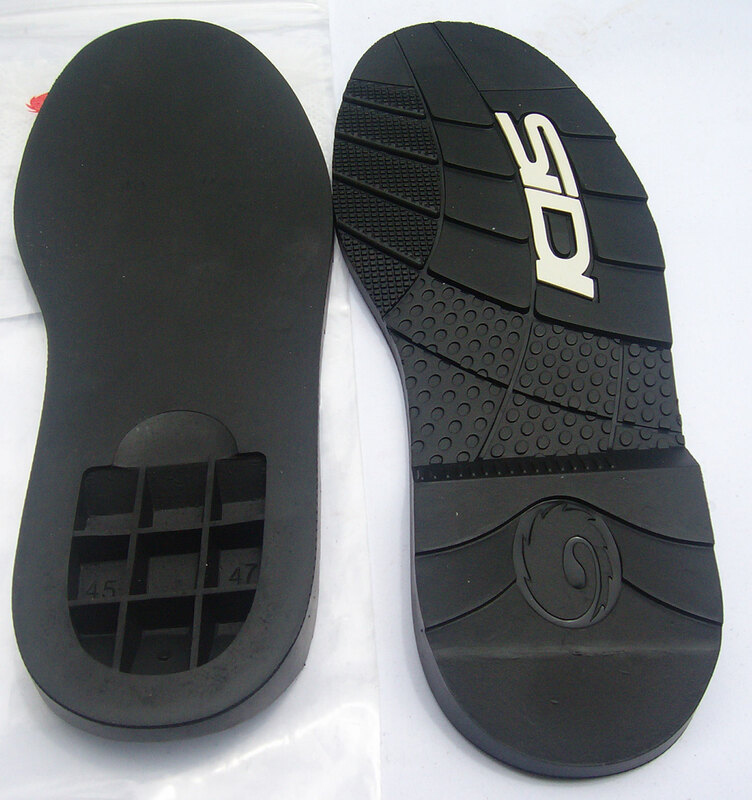 We can also supply you with the SIDI soles or Gaerne soles if you don't have them for replacement. 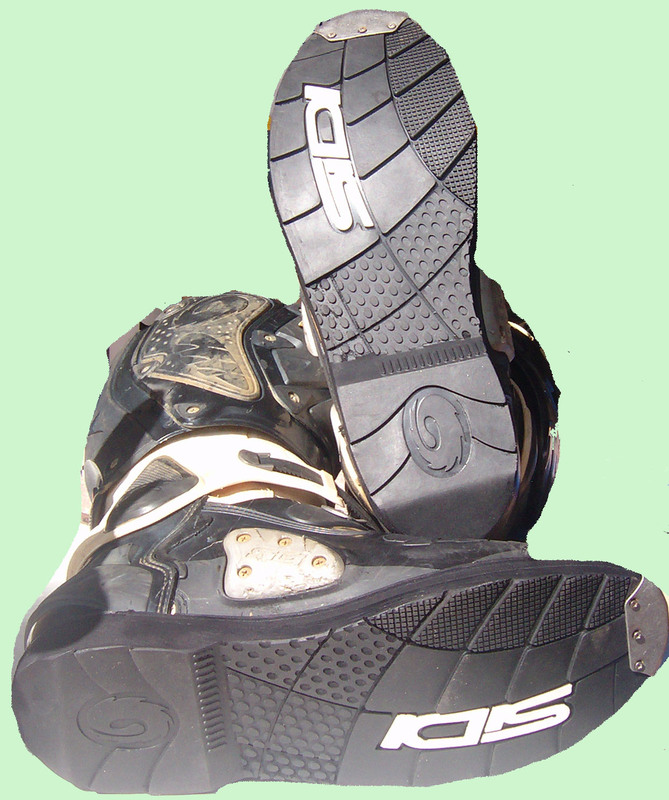 We can also supply you with the Vertigo SIDI soles if you don't have them for replacement. Replacement soles are in stock. If you have the replacement soles, we can fit them for you. We can also supply you with the Vortice SIDI soles if you don't have them for replacement. We can also supply you with the SIDI metal toe caps or Gaerne toe caps if you don't have any for replacement. We can replace your worn out soles with new soles . Tech 10 Alpinestars or Tech 7 Alpinestars we can resole them for you. Alpinestars Tech 7(pre2014) soles are now available for Sizes 10, 11, 12, 13. We have in stock this Alpinestars Toe slider . If you have your own replacement soles we can fit them for you. 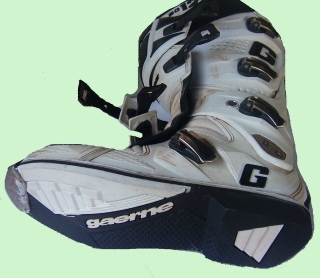 We can also supply you with the Gaerne G-RS/GRW R/MENT Soles if you don't have any for replacement. Replacement of zippers can be done in motocyle jackets and boots. Most zippers on motorcyle jackets can be replaced or repaired. If the zipper is broken, then we will need to replace the zipper. If it is only the zipper slider, then we will replace only the slider as long as we have the slider that suits the zipper.In most cases, the zipper is exclusive to the manufacturer. Chances are we can replace your old zipper with a good quality brand new custom zipper and runner (slider). Sometimes we need to reuse your runner in order to match the rest of your item. Simply send us your boots with the replacement soles and we shall happily fit them for you. Anymake, any model.